What if that basket is dropped? Projects could dwindle, competition could increase, or a variety of other factors could contribute to difficulties for a contractor. And with all the eggs in that one basket, all could be lost. To protect themselves while offering a chance to increase business overall, contractors should look into diversifying. Diversification can be achieved through acquisition of smaller, specialized companies or, on a more feasible scale, through an extension of the company's existing capabilities and resources. Because of the nature of the construction season, many look to snowplowing services as the first area of opportunity when considering diversification. The chance for steady, year-round work, increased profit potential and a list of other benefits make snowplowing a lucrative opportunity - and for some businesses, the difference between surviving or thriving. While there are obvious advantages to diversifying, any new business venture requires careful consideration of not just benefits, but potential challenges as well. It's normal for a contractor to have concerns about diversifying into the snowplowing arena. After all, it's uncharted territory for most. But analyzing the major areas of consideration will show the decision can provide huge rewards for those willing to take the risk. One of the biggest hesitations to diversification is the intimidation of entering something new. It requires one to leave their comfort zone to branch out into the unknown. While it's understandable to want to simply stick with a well-established seasonal business, and one with which that contractor has a security level, the benefits of a year-round business simply can't be ignored. The biggest benefit of offering year-round services is perhaps the most obvious - increased profit potential. Construction season tends to slow down or even completely stop during the winter, leaving both the business and its equipment to sit idle - and unprofitable - until the weather allows work to start up again. To get an idea of the profit potential of offering year-round service, think about the typical construction "off-season". The "off-season" is generally considered December through March, and can even extend a bit longer, depending on when Mother Nature decides to make her entrance and exit. But even assuming only those four months, that equals 1/3 of the overall year - a pretty sizeable chunk of time for a company to be sitting without work. By adding snowplowing services, a business can increase its profit and capital by up to approximately thirty-three percent in a fiscal year. Add to that, keeping the equipment investment productive year-round and considerable benefits are set to be reaped. Chad Oberson is a shining example of a contractor who made a successful leap into diversifying a few years ago. His U.S.-based company's snow and ice business accounts for nearly 70 percent of his total year's profit. He identifies his company as a small one, yet states his typical profits from snowplowing are in the lower six-figure range. Additionally, he states that mid to larger sized companies and those in heavier snow areas can expect to break into the seven-figure arena - not too shabby for a few extra months out of the year. In addition to the equipment being under-utilized in the off-season, a company's employees aren't being used to their fullest potential. When the construction season slows down, seasonal layoffs are common. Many companies lose good workers, as some may seek out new, year-round jobs and not return when construction kicks back into high gear. In addition, many laid-off employees don't look for temporary jobs and instead collect unemployment. This elevates the company's unemployment insurance costs, adding major expense without steady work to off-set that cost. By offering the opportunity for year-round employment, a business minimizes the risk of losing quality employees and additional expenses. Better employee retention also cuts costs associated with hiring and training replacements. In fact, research shows that the turnover cost for one minimum wage worker averages more than $5,000. This number can add up quickly, especially for larger businesses with dozen, even hundreds of seasonal employees. But more than just wasted money, the sustenance aspect diversified companies have over those who offer only seasonal service is significant. Consider what happens when the construction industry takes a hit; work slows down, layoffs occur, and revenue dips. Having another avenue to create revenue can even out those dips and aid in the rough economic times. Furthermore, there's the consistency aspect of snowplowing. When snow falls, it needs to be cleared. It's not up for discussion, argument or interpretation. Snow simply must be cleared to keep roads and businesses open, and prevent dangerous, slippery conditions. Even though every year may not be a record-setting one, the bottom line is snowplowing services will always be in demand. As long as snow falls, snowplowing companies could be in for some major green stuff as a result of all the white stuff. A final benefit to year-round services is the opportunity to build better relationships with customers. By offering multiple services, a business can become a "one-stop shop" - a place to go for multiple needs. The new, planned supermarket in town needs to have its parking lot poured, but also have that lot plowed every year thereafter. A diversified construction company can demonstrate the convenience of working with a full-service company by touting the fact it can both pour the concrete and later snowplow the lot. After seeing the initial potential a year-round business has, many skeptics may take a step towards looking more seriously at snowplowing. The next aspect to consider is one that requires due diligence and even a little bit of research?equipment investment. Successfully entering the snow removal business requires securing the right equipment. These initial costs can often be intimidating to contractors with limited capital. But the investment may not be as significant as one might think, and smart decisions can lead to fast monetary return. One of the biggest upfront costs for a snowplowing operation is the equipment needed to push the snow. This includes both the actual snow pushers and the machines driving the operation. However, a contractor's existing machines such as loaders and skid steers can all be repurposed for snow removal, rather than being left idle for the winter season, leaving the pusher as the only major piece of equipment to acquire. To select the proper snow pusher, a contractor must first analyze the existing fleet. Certainly size will be the first consideration, as each model of pusher is meant for a particular size of equipment - meaning one designed for a large loader wouldn't work on a small skid steer. Local dealers provide great assistance to contractors looking to purchase the right pusher for his or her equipment. Snow pushers come in a variety of sizes, with the smallest measuring 8 feet to larger units extending well over 20 feet. Contractors can minimize equipment costs by analyzing their existing fleet and then fitting with the appropriate-sized pushers. 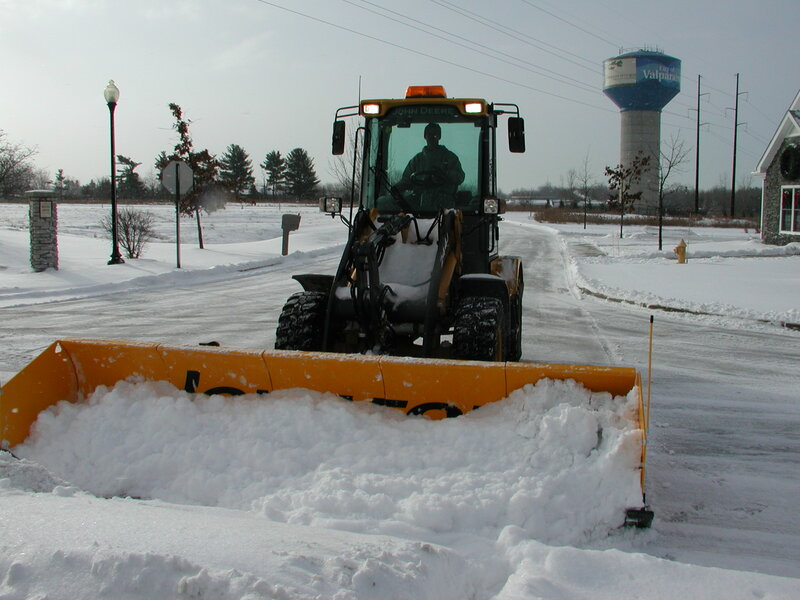 For example, a small skid steer could be outfitted with an 8-foot snow pusher and be ready for use. Those with larger equipment in their fleet would want to look at snow pushers in the 16 to 20 foot range. No matter how big or small the snow pusher, it's important to purchase one with the greatest potential for return on investment. According to Oberson, a high-quality snow pusher will typically pay for itself in the first 30 inches of snowfall - a relatively quick return, considering many areas of the country average this amount in the first few months of the winter season. When it comes to choosing a high-quality pusher, remember: All snow pushers are not created equal. Many are designed to increase efficiency, cut back on salt usage and reduce potential property damage. A pusher featuring a sectional moldboard design moves more snow with each pass, and greatly cuts down on plowing and follow up re-plowing time. Each section moves up and down independently, enabling the plow to essentially contour to uneven surfaces and remove snow from dips and depressions in pavement. Because they're able to remove more snow and ice with one pass, less salt is required as well. Additionally, take a look at the unit's cutting edge. Rubber and steel trip edges are most common options, with steel cutting edges typically being the best option. Steel edges scrape snow and ice down to the pavement and offer cleaner removal with a single pass, further reducing salt needs. Also worth considering is a pusher with mechanical side panels. Unlike rigid, fixed side panels, mechanical panels are designed to rotate up and over obstructions like curbs and medians. While this saves greatly on potential damage to the plow, the real benefit comes in preventing expensive damage to the client's property. Snowplow companies can spend tens of thousands of dollars each year repairing expensive curbing and other such features commonly found in parking lots and on streets. Some of the more modern and advanced pushers may also feature newer hitch designs, providing ease of operation and enhanced results. A snow pusher is picked up and set down hundreds of times during a snow event. Typical hitch designs force the operator to manually adjust the plow each time it's dropped, making for a very challenging, time-consuming and often frustrating process, especially for inexperienced operators new to the plowing game. Newer "drop-and-go" hitch designs do this automatically, saving precious time and ensuring a properly placed pusher every time. In addition to the primary piece of equipment, the pusher, several other pieces of secondary equipment should be considered. Items such as sand and salt spreaders, liquid anti-icing applicators, or snow brooms may be required, depending on the extent of services offered by each individual company. The same principles apply - taking the time to research features and benefits, and make an informed equipment selection is well worth the effort and will pay back dividends. With the decision to diversify made and the equipment purchased, only one big question remains: How to price this new service. Understandably, this is the most critical element in successfully entering the snow removal arena. Without a proper pricing strategy, even with steady work, a company won't be successful. It's worth noting upfront that with any pricing strategy, the determining factor in profitability is the weather - which unfortunately, can't be predicted. Contractors may have an idea of how much snow could fall that winter, but it's impossible to know the actual amount. So a certain level of risk versus reward will be factored into any pricing strategy. There are three basic pricing options and it's up to each individual contractor to decide what's best for his or her operation. The tactic for the hourly rate pricing strategy is the most straightforward and easily understood of the three. An hourly rate agreement means the snowplow company charges customers an hourly rate, based on the time and materials necessary to get the job done. The advantage to charging an hourly rate is it involves less risk; the company gets paid for the work completed?no more and no less. In addition to leaving less room for big profit potential, the disadvantage with this strategy is no real value is placed on contractor efficiency. The company may end up paying more to hourly workers who are, consciously or sub-consciously, dragging out the process in the attempt to take more time and charge the client more. This can inhibit profits by limiting the number of contracts the company can take and also hamper their reputation by appearing slow and unethical. A customer agreeing to a per push pricing strategy means they will be charged every time the snowplow company visits their location. The way this differs from an hourly rate lies mainly in the establishment of a trigger depth. The trigger depth is the decided-upon amount of snow that must be on the pavement before the contractor comes out to plow. Throughout the season, every time the snowfall reaches the trigger depth, the plows are sent out to clear the lot and the customer is charged. The advantage to per push pricing is the guarantee of payment for the work done on each visit. If it's a heavy snow season, the money made will be significant. This approach also rewards efficiency because per push cost is based on on an expected hourly calculation. If the crew finishes the job faster, the whole company wins. The drawback is the risk taken on the part of the contractor. What if it's a light snow season? The plows won't go out as often, eliminating the opportunity for work and dollars earned. A seasonal contract is based on one flat rate of providing snowplowing services for an entire winter season. The advantage of this contract is the guarantee of set payment throughout the winter, regardless of snowfall. If there's only one blizzard the entire season, the contractor is still paid the full amount for that season. However, if it's a heavy snow year, the outcome won't be as profitable, as more work than originally anticipated will be required on the part of the contractor. As mentioned previously, the amount of snowfall or trigger depth will be the deciding factor on when to dispatch the plows. It's important to note there are two subcategories in regards to the seasonal contract option: with or without a cap. The scenario detailed above would be a seasonal contract without a cap. In this case, whether it snows 10 inches or 100 inches, the amount paid by the client is fixed. However, with a cap in place (for example, a 40-inch cap) the amount paid would abide by the contract price up to 40 inches. Anything after 40 inches would be billed at an agreed-upon per push or hourly rate. When supplying a service, it is advantageous to be flexible when it comes to pricing. A company's pricing strategy may be different for each client, as the rate should be tailored to his or her needs and comfort level. One may prefer to charge an hourly rate, but if the client prefers a contract, or "per push" structure, flexibility and accommodation will be beneficial for all parties involved. Ultimately, the decision to diversify a business by adding snowplowing services is up to each individual contractor. However, armed with a full understanding of the benefits and risks involved, contractors can take the leap into the snowplowing arena, and ensure their business won't be left out in the cold this winter season.